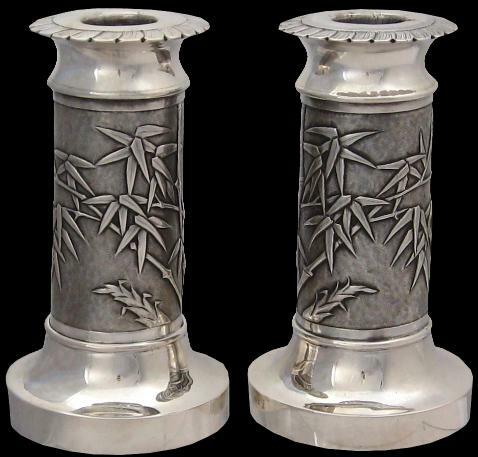 Export Chinese silver candle sticks are relatively rare. Almost none have been illustrated. 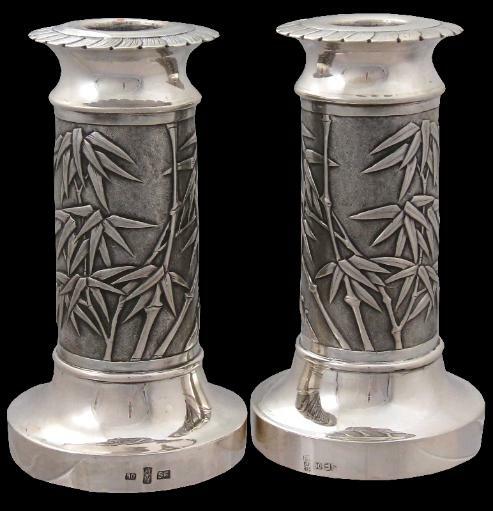 This pair is finely engraved with bamboo canes, leaves and shoots against a ring-mat background. The designs on each are precise mirror images of each other – the sign of a true pair, rather than being merely two items that are the same but without being mirror images of the other. The tops of the candlesticks are in the form of an open bloom, with each petal being incised. The bases are highly polished and flare – perfect for reflecting the light of each candle. Each is stamped to the foot with ‘SF’, an ideogram and ’90’. Sing Fat is believed to be the name of a retailer that had outlets in Hong Kong and Guangdong between 1870 and 1930.